Planning a cookout this summer? 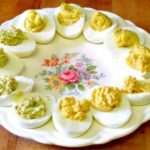 Looking for a dish to carry to a potluck? 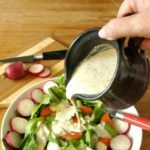 Here are salads that stand up to heat, and a few more ideas to round out the meal! 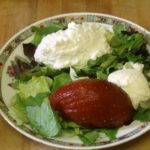 So many of our traditional side dishes at a barbecue include mayonnaise. And obviously we usually don’t have any trouble (though it can mean fussing with them a bit…) but on a hot day they can start to wilt and get a bit greasy looking… Even if there are no issues at all, if five other people brought salad with mayo, sometimes it’s just nice to have another option! So I brought together a few suggestions for both guest and host. First, of course, we always seem to need a potato salad. There must be a law somewhere? 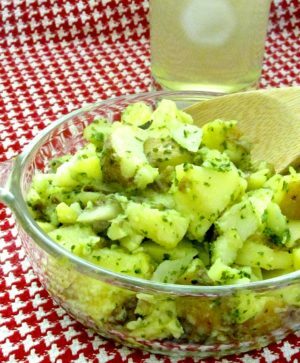 Potato Salad with Parsley uses an oil and vinegar dressing instead of mayo, is spiked with parsley (or you could substitute dill,) and stands up well even in miserable heat and humidity. 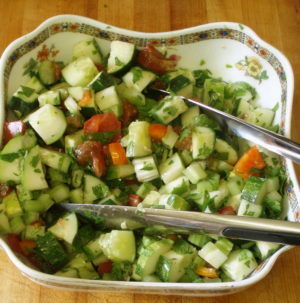 Simple Cucumber Salad is just that – cukes marinated in a light dressing. 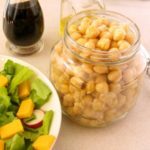 Surprisingly crunchy, eat it as a salad or put a few slices on your burger instead of the pickle! 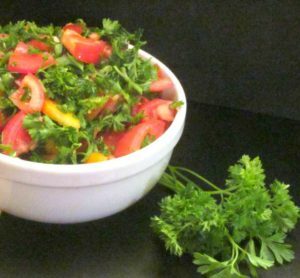 Deli Health Salad is a classic chopped salad. Make it the night before, it just improves with standing. Add other crisp summer vegetables, such as peppers, if you like. Make more than you think you’ll need… in the unlikely event that any is leftover, it will still be good the next day. 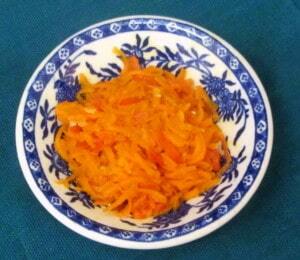 Ginger Carrot Salad works almost as much as a relish as a salad. The flavor is less traditional, but it’s so bright and refreshing that I think it would still be welcome. Equally, Salsa Fresca is, of course, technically sauce, not a salad. I use it as a side salad, though. I’d love it with a burger, too! Which brings us to the rest of the meal. 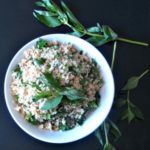 All the salads can be made ahead, and carry well, so could easily serve as a contribution to a potluck. 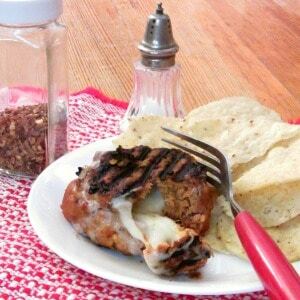 In most cases, though, the host chooses what goes on the grill – and Pizza Turkey Burgers make a change from plain meat patties. Usually there are a few big coolers of soda, and perhaps beer, and maybe a pitcher of iced tea. 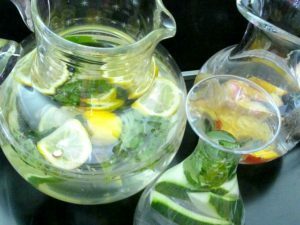 But, especially in the dog days of summer, people really need and want cool water… I’m glad to say that a cooler of water bottles turns up more and more often, but maybe people would enjoy a few big pitchers of infused ice water? 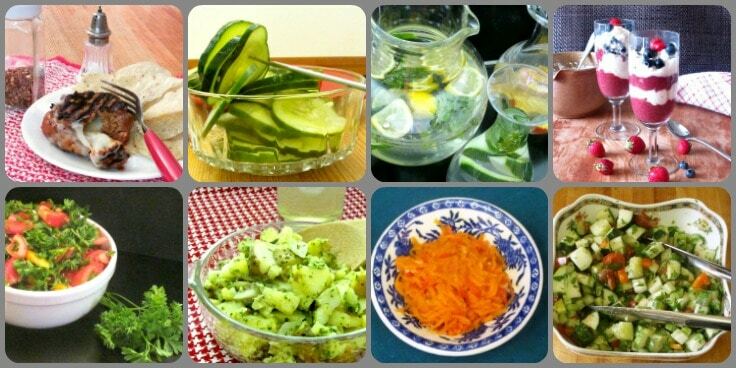 Just infuse the water in a large container (even a soup pot!) and then add to ice in the pitchers – it all looks much more complicated than it is! 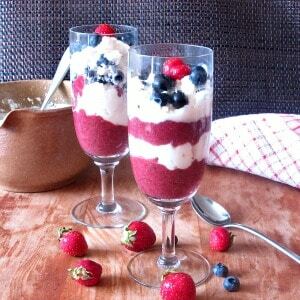 And finally, if you’re feeling elegant, Stars and Stripes Fruit Parfait is a lovely end to the evening… Not, I’ll be honest, what I’d serve at the kind of party where you ask half the neighborhood – but a few close friends ending a wonderful day with something a little special, a little sweet (but no added sugar?) Put your feet up, watch the sun set, and enjoy!